Photography is most generally thought of as an endeavor that freezes the outside world, whether it be far-off habitats, strange civilizations, or everyday life. In a new exhibition at MoMa, A World of Its Own: Photographic Practices in the Studio, attention is drawn inward, to the weird an eclectic goings-on of a photographer's private space. When I think of a photography studio, the first things that come to mind are school portraits and fashion shoots. It's that milquetoast vision that World of Its Own shatters to pieces. Walking into the galleries, it is evident from your first glance around the rooms that something much more raw and unbridled is going on. Lucas Samaras. Auto Polaroid. 1969-71. Eighteen black-and-white instant prints (Polapan), with hand-applied ink, each 3 3/4 x 2 15/16″ (9.5 x 7.4 cm), overall 14 5/8 x 24″ (37.2 x 61 cm). The exhibition is spread out over a handful of rooms, each one devoted to a certain conception of studio space and what goes on inside. There is a helpful but rough chronology to the setup, which reveals much about art history in general, from the picturesque tableaus of the late 19th century, to the rebellious conceptual art of the 1970s. Christian Marclay. Allover (Genesis, Travis Tritt, and others). 2008. Cyanotype, 51 1/2 x 97 3/4″ (130.8 x 248.3 cm). The Museum of Modern Art, New York. To call the spaces where this work is born 'studios' is a misnomer. It amounts to more of a lab environment, where experimentation reigns. Much of the work in the show is a challenge to the idea of photography itself as a medium of documenting life. Instead, it is much more expansive. It encompasses not just what a lens sees but what can be taken apart, re-formed, manipulated, and fabricated from the bare elements of photography. These elements include the light-sensitive paper, as in the case of Christian Marclay's giant photogram, made by placing objects on photographic paper and exposing it to light. They also include the physical capabilities of the camera mechanism, as in early motion sequences of Eadweard Muybridge. On the flip-side of these material process works are the many examples of conceptual art documentation from the 60s and 70s. This version of photography isn't really about photography at all. It is using the medium as a tool for creating evidence of a performance, even if that evidence is video or film. But the resulting artifacts often take on lives of their own, as aestheticized representations of the event or as the only physical traces of the act itself. Digital work is present throughout the galleries, but perhaps less than it should be. Considering we live in a time when the idea of the photograph is being questioned so aggressively by digital tools and methods, often applied in the privacy of a new type of "studio," it was shame that the resulting forms were not more prevalent. Despite the occasional misstep, the greatest pleasure of the show is its accessibility. 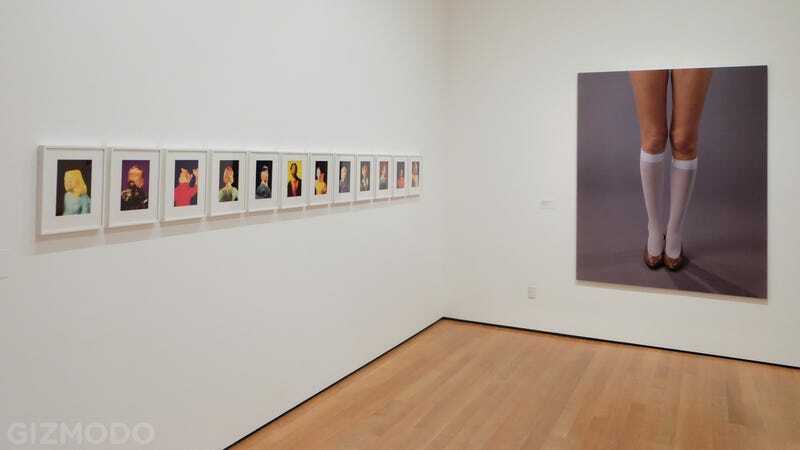 An atypically small portion of the works on display are overly dry or academic, which is a welcome shift for MoMa exhibitions featuring contemporary art. There is something for everyone, with a diversity of styles and materials on display, while not failing to challenge the viewer about what photography can be. A World Of Its Own is on view through October 5th, 2014 at the Museum of Modern Art in NYC.